Donnie Hilliard starts the Travis County Veteran's Court Program on May 15, 2014. At the Travis County veterans court, people clap each time a vet walks back to his or her seat from the judge’s bench because they've completed one of the phases of the program. On a recent Thursday, Omar Lopez, who's been out of the Navy for seven years, gave a graduation speech. He mentioned six recent accomplishments – among them, staying sober for the past 14 months. Veteran Omar Lopez gives a graduation speech at the Travis County veterans court on May 15, 2014. More than 10 counties in Texas have veterans court programs. Hays County will start one later this month, and Williamson plans to start one later this year. 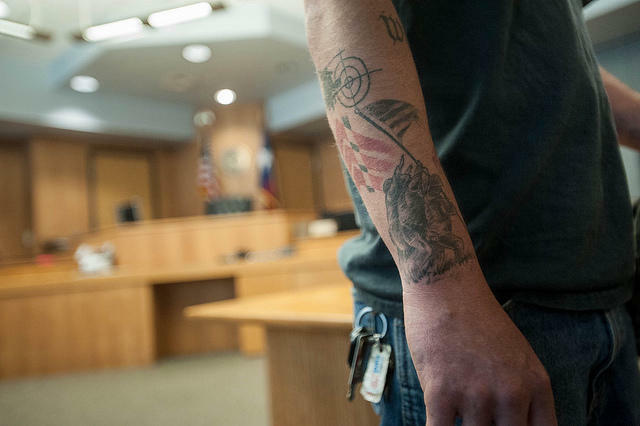 "There’s a significant drawdown of the armed services, and so these people are coming back into the community," says Jackson Glass, the manager for Travis County’s Veterans Court. "So what we’ve seen is a wave of combat vets and having difficulties adjusting, which frequently leads to them getting arrested." Glass says the idea isn't to punish the veterans. "The idea is that we all are joining together to create a support system for these men and women who have lacked that since they got out of the military," he says. "So the primary thing is letting them know, 'Hey, we’re here to help you and get you through this.'" Judge Herb Evans, filling in for Judge Mike Denton, speaks to a veteran at the Travis County veterans court on May 15, 2014. 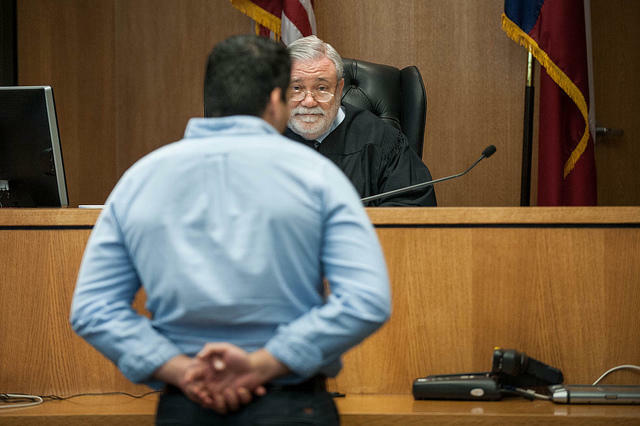 Veterans have to meet certain criteria to qualify for the court: an overseas deployment in a combat or hazardous area, a diagnosis including PTSD or traumatic brain injury and the offense that got the veteran arrested has to be connected to the diagnosis. Christopher Martinez also graduated the same day Lopez did and told his story. 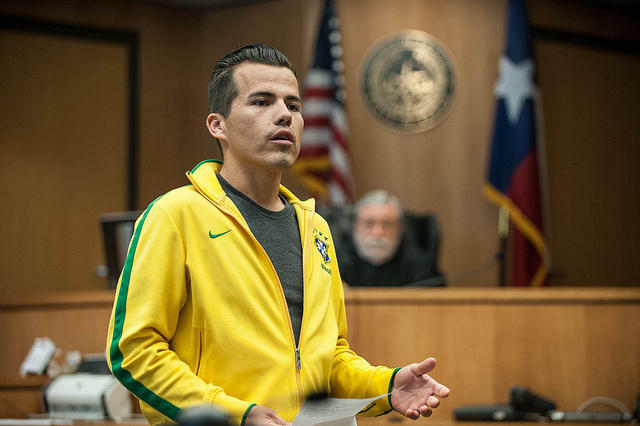 "I would just really like to take the time to thank everybody for the opportunity to learn from my mistake," Martinez said in the third-floor court room. "Dec. 7, 2012 was the night I got pulled over and received a [DWI]." Martinez served in the Marines and was deployed to Iraq and Afghanistan. He's been out for five years and has been sober for seven months. "I find that getting pulled over that night was a huge blessing in disguise," he said. "I was able to learn from my mistake again and reach down deep inside and figure out what it was that was causing me to drink." 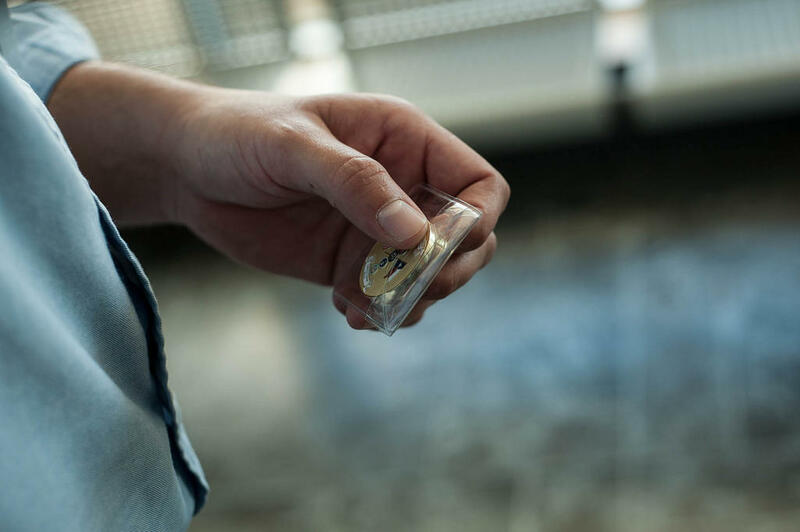 Chris Martinez, a Marine veteran who served in Iraq and Afghanistan, holds a medal he received after completion of the Travis County Veteran's Court Program. Judge Mike Denton presides over the Travis County court. A veteran himself, he says people on the street are increasingly unfamiliar with life as a veteran. "If you look at the number of people that went to combat in World War II, Korea, Vietnam and now, it’s been a steadily declining number," Denton says. The Texas Legislature passed a law allowing veterans courts back in 2009, but Judge Denton says they didn’t get much more than that authority. He testified at a Legislative hearing earlier this month. "We all set them up quite frankly on our own without a lot of guidance and so we’re not all the same," he says. "And so one thing we probably need to do is working through the Legislature is come up with a standardized court system for veterans so any county that wanted to follow suit could set one up without having to go through the hurdles that we had to overcome." Travis County Constable Maria Canchola knows well the tolls that military life take on a person. Her husband is a Vietnam vet who grappled with PTSD. She’s one of the veterans court’s founders, along with then constable, now Travis County Tax Assessor Bruce Elfant. She tears up when asked what it's like for her when she sees veterans graduate. "Very emotional when I hear them thank the court for letting them have their lives back. That means a great deal to me and to everyone who worked on the court," Canchola says. Donny Hilliard has a number of tattoos related to his military service. 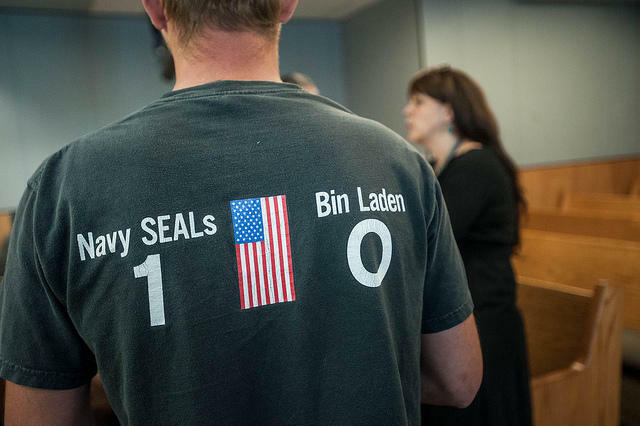 He began the Travis County Veteran's Court Program on May 15, 2014. Even as some veterans finish, others are just getting started, like Donny Hilliard, who did two tours in Iraq. "This is my first time I’ve ever been in trouble or done anything," Hilliard says. He says he wants to finish the program as fast as possible to avoid the time away from his business. Hilliard says one of the biggest challenges of life in the civilian world is getting used to how little people respect each other. "If you don’t look out for the person to the left or right of you then you’re pretty much not looking out for yourself," Hilliard says. "And in the civilian life, everybody looks out for themselves and they have that one-track mind to where in the military you’re looking out and you’re looking out for everybody." Perhaps veterans find a sense of community at this court. They have to stick to a strict schedule of court visits and counseling. But every two weeks, a cheer goes up for the vets who get through it. 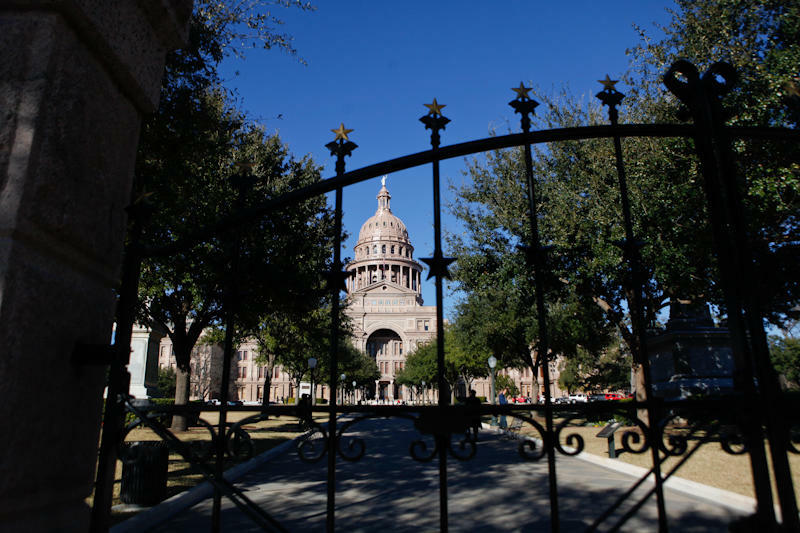 Improving mental health practices for Texas and reducing the stigma associated with mental illness is the goal of a new statewide institute. Its focus will be on children, veterans and criminal justice policies. The Meadows Mental Health Policy Institute opened its doors today. Tom Luce, its chief executive officer, says the nonprofit will do research to improve access to mental health care in Texas – and not just after emergencies like the recent Fort Hood shooting. America’s oldest living World War II veteran lives in Austin. And today, he was the guest of honor for a very notable host: President Barack Obama. Today wasn’t the first time 107-year-old Richard Overton made the trek to Washington D.C. For this May’s Armed Forces Day, Overton was part of an Honor Flight to the nation’s capital. Nonprofit group Honor Flight Austin flies World War II veterans to D.C. to show them the national memorial built in their honor. 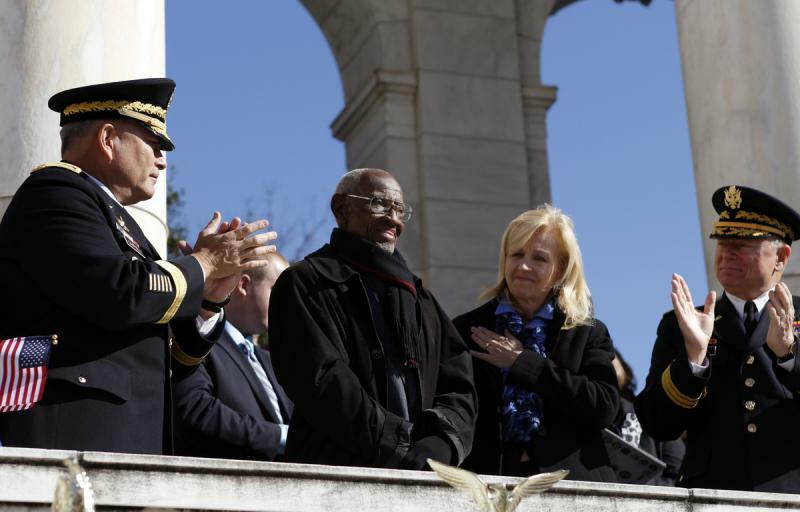 As USA Today reports, when Overton visited the capital this spring, he expressed a wish to meet President Barack Obama. “The president was out of town that day,” the paper writes, but Austin Mayor Lee Leffingwell’s office facilitated a return visit to D.C. this weekend. And this time, Overton’s request came true.